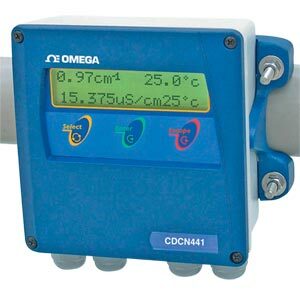 The CDCN441 conductance/resistance analyzercontroller is designed for online monitoring of process solutions and water applications. Applications include: waste water treatment, power plants, thermo electric plants, pharmaceutical, photographic industries and soft drinks industries. The menus are self guiding with simple three button programming. Available control outputs include ON-OFF or pulse width modulation. The transmitter output is also programmable from the keypad eliminating the need for potentiometer or dip-switch settings. The calibration function automatically recognizes the cell used and the buffer solution resulting in a simple and straight forward system calibration. Equipment is built with solid state technology, electronic contacts and not electrical contacts, avoiding mechanical movement and off course no sparks. 참고: Comes complete with 316 SS hardware for 51 mm (2") tube installation and wall mount brackets and operator’s manual. Sensors sold separately.